Boyzone were formed by manager Louis Walsh who advertised an audition for boys to form a vocal group. More than a hundred auditionees tried out including the then unknown Colin Farrell. The band, initially a six piece outfit who made their first appearance (only a day after being formed) on Ireland's top-rated Late Late Show dancing to a backing track, eventually comprised Ronan Keating (who would in time become the group's lead vocalist), Mikey Graham, Stephen Gately, Shane Lynch, and Keith Duffy. The band played through 1993 and in the early parts of 1994 to anyone who would listen, traveling all over Ireland in an old transit van, playing in nightclubs whilst hoping for a record deal. Polygram signed them up and released the cover version of the 1966 Four Seasons hit "Working My Way Back To You", featuring Mikey Graham and Stephen Gately on lead vocals, something which was not repeated. It reached No. 3 in the Irish Charts. The boys became stars overnight after being surrounded by mobs of screaming girls everywhere. They also appeared on the Childliners record The Gift Of Christmas alongside acts such as Backstreet Boys, MN8, E.Y.C., Sean Maguire, Deuce, Ultimate Kaos, Let Loose, East 17, Peter Andre, Michelle Gayle, Dannii Minogue and many more. Future singles featured Stephen Gately and Ronan Keating together or Ronan Keating alone assuming lead vocals. This led to a light hearted campaign by some fans to "Let Mick Sing". The song "Love Me For A Reason", cover of the 1974 Osmonds hit, came next. It also gave them a Smash Hits Award for "Best New Group". They released "Said and Done", their first album in 1995, reaching the top in both UK and Ireland. London's Rock Circus invited them to place their handprints on the "Walls of Hands" besides the likes of Eric Clapton and Michael Jackson. The group released the album "A Different Beat" in 1996, which contained their first UK number one single, "Words" further number one, "A Different Beat" and the single "Isn't it a Wonder". After the release of the album "Where We Belong" in 1998, the boyz finally gained the respect they deserved. This contained the singles "All that I Need", "Baby Can I Hold You" "No Matter What" "I Love The Way You Love Me" and "Picture of You". Ronan received the "Ivor Novello" award for "Picture of You" as featured in the film Mr Bean. Wax figures of the boyz were made beside U2 in Dublin. "No Matter What", their best selling single, was voted "Song of the Year". In 1999, their greatest hits compilation "By Request" was released and another sell-out tour. At this time, due to the threat of a tabloid expose, Stephen told the world that he was gay. The fans supported him and his boyfriend Eloy de Jong. The boyz splintered and took off to pursue individual careers, hoping to reap huge success. The group performed together for the last time in January 2000 after which Ronan Keating, Stephen Gately and Mikey Graham all pursued solo careers, with varying degrees of success. In addition, Keith Duffy and Shane Lynch also released a single. In the seven years that they were together (1993 - 2000), Boyzone rose to the top echelon of Ireland's pop music. Dubbed "most promising band of the year" by British magazine, Smash Hits in 1995, the group more than fulfilled the modest expectations that followed their Late, Late Show performance. All sixteen of their singles reached the top five and they became the first Irish act to have four number one hits in the United Kingdom. Their 1998 tour of Ireland shattered all sales records when 35,000 tickets were sold out in four hours. is a song from the 1996 musical Whistle Down the Wind written by Andrew Lloyd Webber and Jim Steinman. 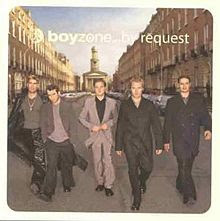 This song gave Boyzone a twelfth UK top 5 hit, the first act to obtain such a run with their first 12 releases. It was the biggest selling single ever released by an Irish act in the UK and eventually became the most successful single produced from a musical in history. The song was also recorded by Meat Loaf and included on his The Very Best of Meat Loaf compilation album. "Baby Can I Hold You'"
is the third single from American contemporary folk artist Tracy Chapman, released in late 1988. The song succeeded in reaching the top fifty in the U.S., unlike its predecessor, "Talkin' 'bout A Revolution", but it failed to become Chapman's second top forty hit, peaking at #48. It did, however, give her a second chart entry on the U.S. Adult Contemporary charts, peaking at #19 in early 1989. (Her first adult contemporary hit was "Fast Car", which reached #7 on the AC charts.) Given the commercial decline Chapman suffered following the release of her second album Crossroads, "Baby Can I Hold You" also became her last top fifty hit until 1996's "Give Me One Reason". was a popular single by The Osmonds and Boyzone. Written by Johnny Bristol and produced by Mike Curb, "Love Me for a Reason" was The Osmonds' last top ten hit on the Billboard Hot 100 singles chart, reaching #10, it peaked at #2 on the Billboard Adult Contemporary chart. In the UK it fared even better, spending three weeks at the top in August 1974. The song was revived by Boyzone in 1994, becoming their breakthrough single in the UK, reaching #2 on the UK singles chart in December that year. Boyzone opened the door for fellow Irish boy band, Westlife. Since Boyzone split in 2000, Ronan Keating has made a career from going solo and has released five albums; Stephen Gately released a modestly successful solo album and is now pursuing a career in stage acting and particularly West End musicals, starring in the Andrew Lloyd Webber's "Joseph and the Amazing Technicolor Dreamcoat"; Mikey Graham has also pursued solo projects and now works as a music producer; Keith Duffy has appeared in the British Soap "Coronation Street" as well as a number of theatre productions in Ireland; Shane Lynch recently appeared on the Reality TV Show, "Celebrity Love Island". is a popular song written by Randy Goodrum. It was a number one single in the United States during 1978 for Canadian singer Anne Murray. The song, included on her 1978 album Let's Keep It That Way, was also a top-five country single and won Song of the Year at the Academy of Country Music awards. Curiously, although the song reached number one on the Billboard Hot 100, it reached only the top five on the two Billboard charts where Murray had the most success - Country and Adult Contemporary. "You Needed Me" was also Murray's biggest hit in the United Kingdom, where it reached #22. A 1999 cover version by Boyzone was released. The single famously beat former Spice Girl Geri Halliwell's debut solo single "Look At Me" to number one on the UK Singles Chart.